Oh boy! Last year, while attending the International Summit on Community Wireless Networks (http://wirelesssummit.org) last October, Ben had a chance to meet up again with the emmient Luka Mustafa (Musti) of WLAN Slovenija. They're pretty cool, operating a wireless network that actually traverses the whole country! And they make awesome schwag. After being lost in postal limbo a couple months or so, our tshirts arrived! 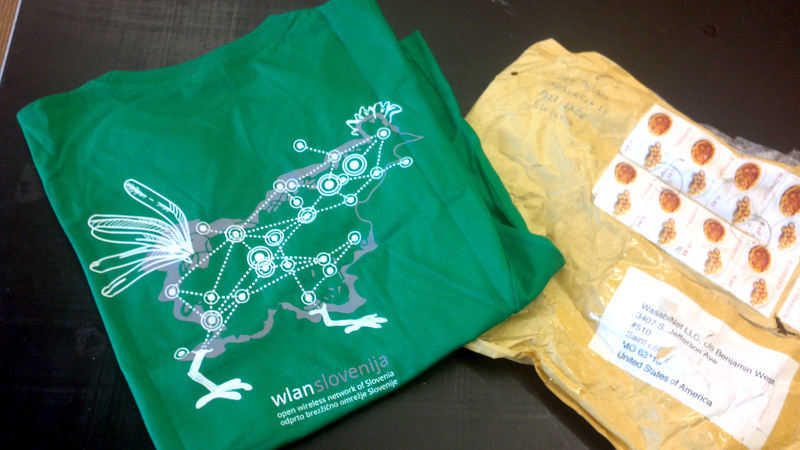 The chicken is very cool, but that is also a map of their wireless network spanning the entire breadth of Slovenia. That's awesome!